The momentous events of Tahrir Square, Egypt also signify a huge step forward for gender equality in the region, women’s rights activists said Friday. Nora Rafeh Refa Tahtawi, a youth activist who participated in the Tahrir protests and is now in New York for the two- week Commission on the Status of Women at U.N. headquarters, recalled that women stood side by side with men, all sharing the feeling that they belonged to the same movement with the same goals. Dr. Azza Kamel, a prominent Egyptian women’s rights activist, was also part of the movement that toppled president Hosni Mubarak earlier this month. “There is no room for ethnic tension,” she added, highlighting the idea of “family” described by Tahtawi with the formula “one heart, one hand, one brain”. 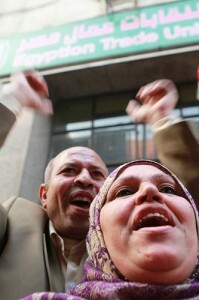 “No one will manage to divide them [the Egyptian people] now,” Kamel said. Photo courtesy of Sarah Carr under a Creative Commons License.